Reasons to evacuate generally fall into 2 camps: Urgent Evacuations and Planned Evacuations. 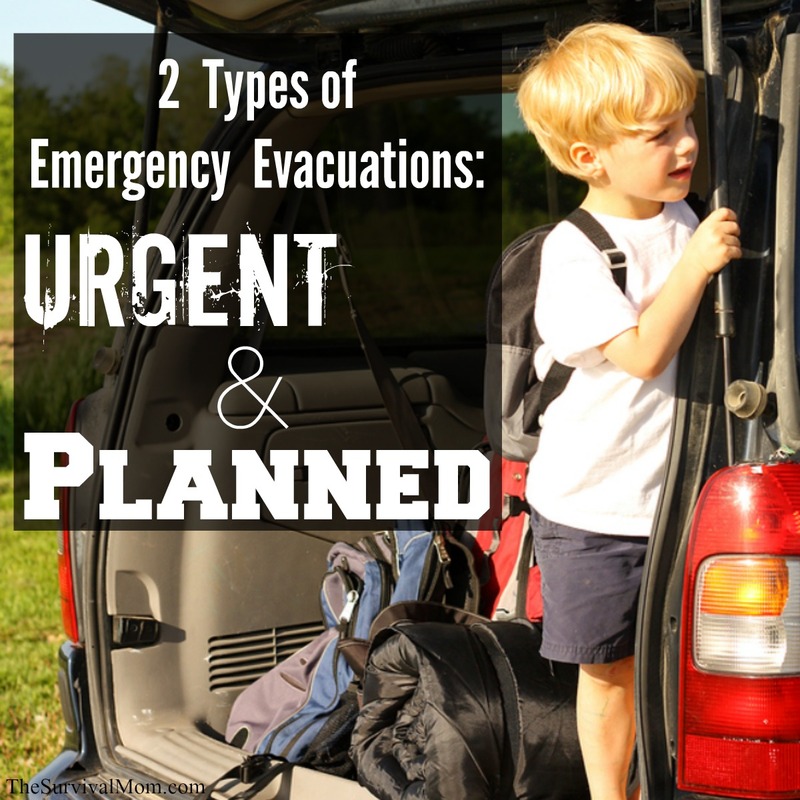 You should be ready for these 2 types of emergency evacuations. Before you begin packing that emergency kit, you need to first consider why you might need to evacuate. If you have specific scenarios in mind, and then one of them suddenly becomes a reality, there’s a good chance that your brain won’t lapse into normalcy bias, causing you to waste precious minutes or hours. An Urgent Evacuation is one in which you have zero time to think; you can only react. If you’ve considered this scenario, have planned for it, and have a routine that you’ve rehearsed, your brain will most likely revert to those memories and your actions will become automatic. The smell of smoke and realization that your home is on fire is not the time to inform the kids how to get out of the house, run around scooping up family heirlooms, cash, and vital documents, and then yell at everyone to meet you in the front yard! Fire spreads too quickly to allow for any of that. Instead, planning for this particular Urgent Evacuation is simple. 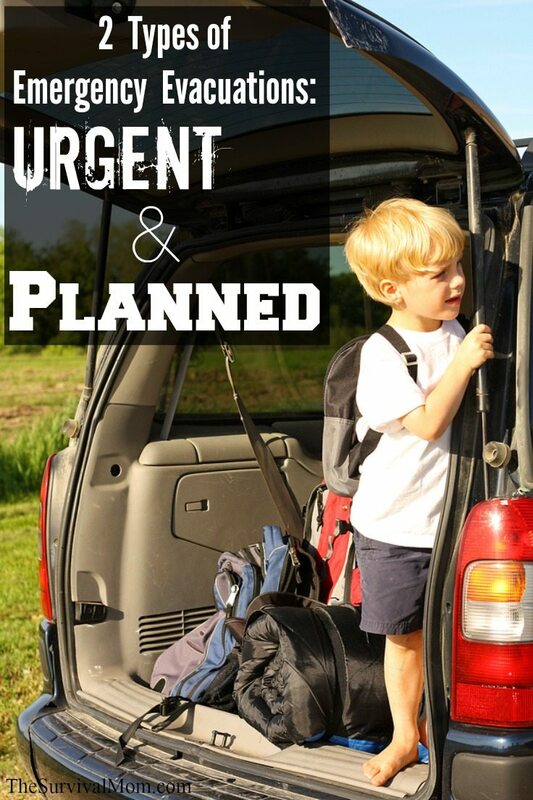 Take time to stash valuables in a fireproof safe, train the kids and other family members to get out of the house ASAP, and have a pre-planned meeting place. Make sure that each room has an exit point that can be accessed by everyone, even if that means keeping a step stool or a sturdy chair in the room. My daughter’s bedroom has one window whose bottom ledge is a good 4 1/2 feet from the floor. In her case, she’ll need to stand on something to get out. 1. Have a packed supply bag for your pets, complete with food, bedding, and food/water bowls. If your pet will be transported in a crate, place all supplies in the crate. Everything will be in one place when you need it. 2. Create a “Last Minute Bag” with things like prescription medications, cash, small valuables. Here’s a complete list to help you with this task. 3. Store emergency kits in an easy to access location, such as by the backdoor. They can also be stored in the trunk of your car, along with a case or water. 4. Be in the habit of having your vehicle ready with at least half tank of gas and emergency supplies. 6. Practice this evacuation drill and keep track of how much time it takes to get everyone out of the house. Emphasize that getting people out is far more important than any belonging, or even a pet. 7. Have written lists of what must be grabbed. Prioritize so that no one is searching for something that isn’t strictly necessary. With Urgent Evacuations, the longer you wait, the more likely you are to endanger yourself and your loved ones. It also increase the chance that you’ll run into major traffic issues as panicked people also try to get away from harm. Not every emergency is one that requires great haste. In many cases, you have several hours or day in which to make your plans and put final pieces in place. A Planned Evacuation requires a different mindset — one that emphasizes checking and double-checking and keeping a constant eye on developing news. The Planned Evacuation is one of prepare and wait-and-see. For example, a hurricane is a scary natural disaster that can bring with it an enormous amount of damage, but thanks to modern meteorology, we can track these storms. We know, with a fair degree or accuracy, when and where they will make landfall. Earthquake — If your home isn’t too damaged, you may want to plan to evacuate, just in case. “Storm of the Century” — Blizzard or otherwise, you may want to get out to avoid the worst. Volcanic eruption — Usually these give some warning before erupting. 1. Make a date on your calendar to review and refresh all emergency kits every 6 months. 2. Have at least 2 different ways to get information, in case of a power outage or if telephone/cell phone lines aren’t working. A shortwave radio and ham radio are both good choices. 3. If you have a smartphone, install phone apps that provide alerts for inclement weather, tornadoes, earthquakes, and hurricanes. Red Cross makes several, and they are all excellent. 4. If you have larger animals, contact at least 2 locations that could provide temporary shelter as part of your emergency evacuation plans. 5. Give careful consideration how your home can best be protected while you’re gone. You have time to board up windows, drain pipes, etc. 6. Get phone numbers from neighbors, so you can keep in touch and update each other with news. This will be especially important if you do evacuate and want to know how your home and neighborhood are faring. 7. During the school year, contact your child’s teacher and ask for a list of their assignments for the coming week or two. 8. Make sure your vehicle is filled with gas and is ready to go. 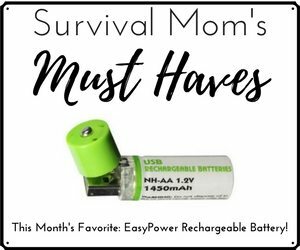 Pack it with any supplies or gear that you won’t be needing, just in case you decide to leave. 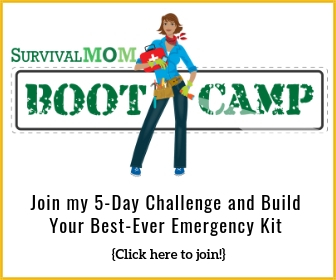 The good news about both these types of emergency evacuation plans is that preparation for one is preparation for both. The major difference between the two, other than the actual event, is your mindset. You must be the one to make the call to get out now or wait to see how things unfold. Ultimately, it will be your call. It’s better to err on the side of a quick evacuation if there’s a chance the event could escalate. By then, you might be trapped and unable to get out. Know which events are most likely in your area and begin planning and preparing. I follow your pinterest boards and read your articles. I find your information excellent and your advice very good. However, I have a concern with number 7 above, to ask your child’s teacher for assignments in an emergency situation. So many people forget that the teacher is a person too, likely with a family and a need to get to his or her own preps and bug out plans. 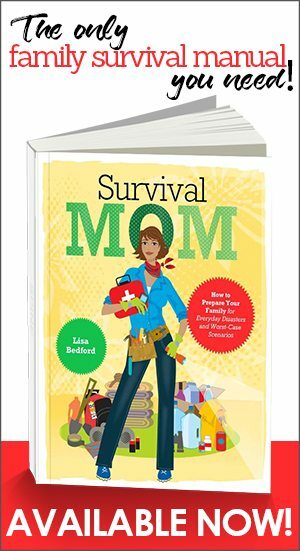 Please have your own plans in place for occupying and educating your children in an emergency situation and do not place an additional burden on another human being. I am a teacher with a husband and four children, the youngest being 4. In an emergency situation I will not be creating long term lesson plans for your children, I will be working to insure my family’s safety. This does not make me a bad teacher or a bad person. I used to be a teacher, so I know where you’re coming from. If an emergency is one that gives teachers, and families, time to prepare, then yes, teachers can provide a list of assignments should the school shut down for a while. Frankly, I’ve never heard of a teacher refusing to provide children with a list of assignments when the child’s family is going on vacation or if the child is sick for a period of time. An emergency that may require a planned evacuation is no different. In case of something like a tornado, where there is no time to think and barely enough time to find a safe shelter, then of course, no one has that expectation. One more thing, it’s good to get the call to evacuate or to prepare for evacuation. Most people are notified by TV news or by a first responder knocking on the door. Much better to get a Reverse 911 emergency notification cell phone call, text and email from the EMA. These are local authoritative messages and updates that are location specific. If needed, you know quickly when to pick up your go bag and leave without waiting for a knock on the door. 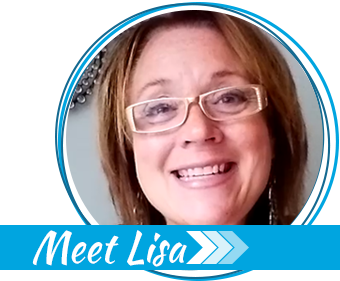 Thanks again, Lisa for a great and thought-provoking article! Something worth mentioning is a way out of upstairs bedrooms in the event of fire, for example. A second story fire escape ladder is a very affordable and worthwhile investment. In our house, a fire downstairs could easily prevent us from exiting on the first floor, so we have one of these in the main bedroom, which is close to the other occupied bedrooms upstairs. Everyone can get to it quickly. Drilling a fire escape using it is a good idea too, because this kind of climb can be scary and it would be better if a dire emergency wasn’t the first time you or your family tried it. It is better to be prepared on both, it’s less panic. even if it is urgent or planned, emergency is emergency, disaster is disaster no one can ever predict when it is going to happen. What we can do is; If we knew that there is a big typhoon prepare ourselves and the rest of the family, have the 72 hour bag always ready and place it where you can grab it easily. listen to the radio. And in case you really need to evacuate the house just grab your bag 72 hour survival kit and go. And to add to that we, can also prepare even a small survival kit because someone might needed it, in this case we can also help other people. By the way, you have a very nice article.